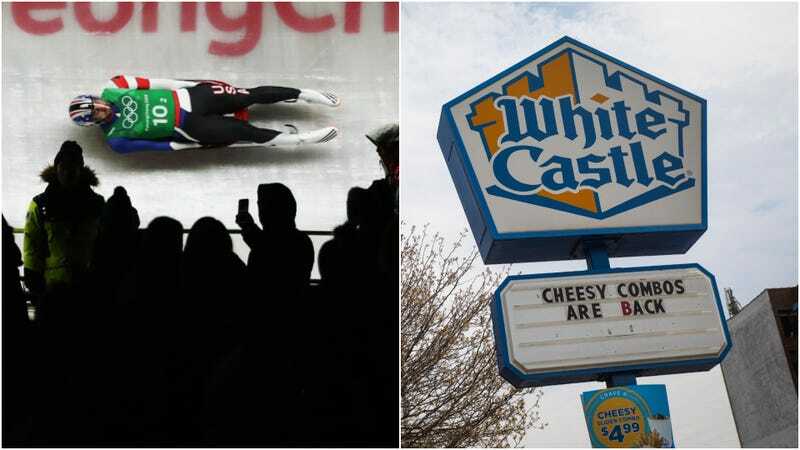 White Castle sponsors a luge team. To be specific, it is “the first and only fast-food organization to be named an official partner of USA Luge.” This isn’t new, but it’s new to me, and it’s in the news because White Castle and USA Luge announced today that the partnership was renewed for an additional two years. Because White Castle wants to nurture America’s SLIDERS. Reader, I am obsessed. Whoever thought of this deserves a raise. It’s perfect. “The nation’s two foremost slider experts” also partner on USA Luge’s offseason recruitment effort, appropriately titled the White Castle USA Luge Slider Search. Over the last two off-seasons, the program “introduced the sport of luge to more than 1,200 youth across the U.S.” The release credits Slider Search with 65 percent of all the current junior sliders in USA Luge’s system, as well as half the athletes competing in the 2019 Luge World Championships in Winterberg, Germany. Not bad for a pun-related fast-food sponsorship. If you have a kid who wants to rocket down an ice chute at 90 m.p.h., you can read more about Slider Search here.